Please type your desired tags, e.g. Hypoxia, Public and Nonprofit Management, Genomics, Systems and Computational Biology, Medicinal, Innate Immunity, Technical Writing, Information Systems, Dietetics, Chess, Literary Theory, Culture, Southern Literature, Appalachian Literature, Heroic Archetypes, LGBTQ literature, and etc. Jay Kim lab is focused on understanding the heterogeneous metabolic signatures and targetable vulnerabilities in squamous cell carcinoma utilizing genetically engineered mouse models (GEMMs) and patient-derived xenograft (PDX) systems. Another major focus of our research is to understand the significance of hypoxic signaling and metabolic reprogramming of fibroblasts in cancer progression and fibrotic diseases. Lung cancer is a leading cause of cancer related death and has a higher mortality rate than colorectal, breast, and prostate cancers combined. Lung squamous cell carcinoma (SqCC), a subtype of lung cancer, accounts for 25-30% of all lung cancers. Although much research into lung cancer and possible treatments are being investigated, lung SqCC has benefited very little from the application of targeted therapeutic options, as a result, decades old platinum-based chemotherapy regiments remain the first-line treatment options. Therefore, identification of targetable vulnerabilities in lung SqCC is imperative to improve therapeutic outcome of lung SqCC patients. There is an increasing body of evidence arguing for substantial heterogeneity in how individual cancers utilize glucose in promoting tumorigenesis. We recently reported that lung SqCC exhibits distinctively elevated GLUT1 expression resulting in high susceptibility to glycolytic inhibition whereas lung adenocarcinoma (ADC) is significantly less reliant on glucose and thereby resistant to glycolytic inhibition. Our group is focused on elucidating the molecular mechanisms underlying this previously unrecognized GLUT1-mediated glucose metabolism in lung squamous cancers. Targeting cancer glycolysis, on the assumption that glycolytic metabolism is uniformly elevated in most human cancers, has proven to be clinically unsatisfactory. Our discovery of distinct and exceptional glycolytic signature and glucose reliance phenotypically linked to lung SqCC argue that lung SqCC can be uniquely vulnerable to glucose restriction. The tumor microenvironment is comprised of host stromal cells, soluble growth factors and extracellular matrix that plays a critical role for virtually all tumorigenic processes. Tumor-associated stromal alterations are integral components of the tumor microenvironment that contribute to tumor growth and progression. 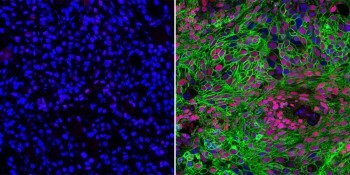 Among many cellular populations, stromal fibroblasts are prominent cell populations of the tumor microenvironment and have been implicated in the development of various cancers including breast and pancreatic cancers. Unlike stromal cells residing in normal tissue, tumor-associated fibroblasts exhibit distinctive tumor-promoting features: they contribute to tumor cell proliferation, inflammation, angiogenesis, invasion and metastatic dissemination.​​In particular, my laboratory is interested in the mechanisms underlying the effects of stromal hypoxic signaling in tumorigenesis, angiogenesis and remodeling of the tumor microenvironment. The remodeling response to hypoxia is controlled primarily by hypoxia-inducible transcription factors (HIFs) 1 and 2, and the negative regulator of HIFs, von Hippel Lindau protein (VHL). 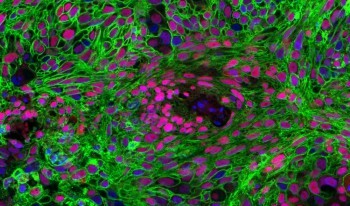 We employ transgenic animal models in which the hypoxic response has been genetically ablated via deletion of VHL, HIFs and their target genes in various stromal components including fibroblasts in various tumor models to better understand the relationship of tumor-associated fibroblasts to tumor progression in the context of the hypoxic tumor microenvironment. Pulmonary fibrosis, scarring of the lungs caused by many conditions such as infections, environmental agents, and certain medications, is a ultimately fatal progressive disease with not only limited treatment options but also a poor prognosis and a survival expectancy of less than five years. Furthermore, idiopathic pulmonary fibrosis, the most common form of the disease, has no known cause. Therefore, it is crucial that mechanisms underlying pulmonary fibrosis progression be elucidated.​The presence of myofibroblasts in the animal models of pulmonary fibrosis as well as patients with lung fibrosis has been well documented in the current literature. Furthermore, myofibroblasts, which are responsible for the deposition of the matrix that constitutes the scar, have been found to play integral roles in the pathogenesis of this disease. During fibrotic progression, myofibroblast differentiation of pulmonary fibroblasts is a major process that facilitates the progression, migration, and secretion of extracellular matrix and collagen. In my lab, we are currently investigating the glycolytic reprogramming of fibroblasts that is crucial in fibroblast to myofibroblast differentiation utilizing in vitro culture as well as animal models in order to identify novel therapeutic targets. More than $4.5 million in new funding from state and federal agencies will support cancer-related research over the next five years at The University of Texas at Dallas. Two projects related to brain cancer, each totaling $200,000 over two years, recently received High-Impact/High-Risk Research Awards from the Cancer Prevention & Research Institute of Texas (CPRIT). A third CPRIT grant, of nearly $3.6 million over five years, will be used to establish a new core imaging facility for preclinical research. That award will be combined with $400,000 in matching funds from the University. The Department of Defense (DOD) also recently awarded the University more than $527,000 for lung cancer research. 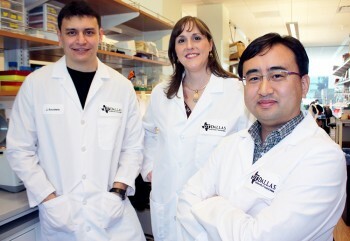 A biologist at The University of Texas at Dallas and his colleagues have discovered that two enzymes previously linked independently with keeping cancer cells alive actually work in tandem to spur tumor growth. “There has been no reason to suspect these two proteins interact, but now we know they do. 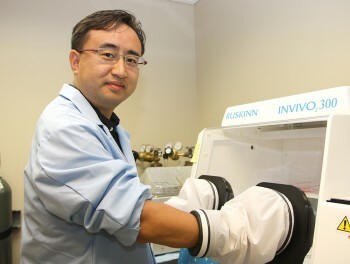 This finding was totally unexpected,” said Dr. Jung-Whan (Jay) Kim, assistant professor of biological sciences and co-lead author of the study published online Dec. 14 in the journal Nature Communications. New findings about the biological links between obesity and insulin resistance and Type 2 diabetes may also shed light on the connection between obesity and cancer, says a scientist at The University of Texas at Dallas. 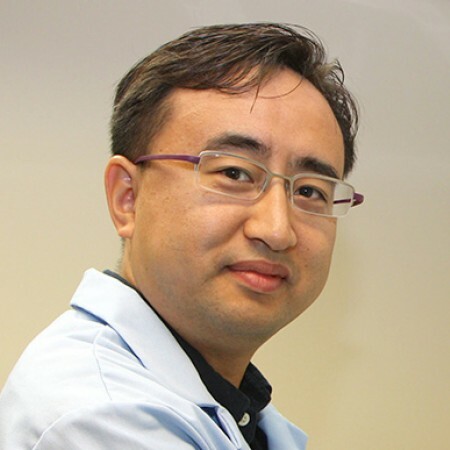 In a study published in the journal Cell, UT Dallas’ Dr. Jung-whan Kim and colleagues at the University of California, San Diego found that a protein called HIF-1 alpha plays a key role in the development of insulin resistance and Type 2 diabetes in obese mice. 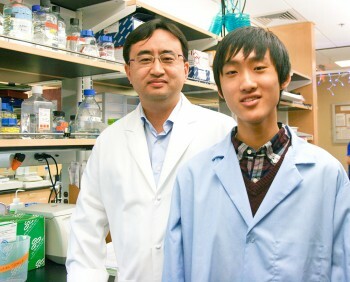 Two summers and many late nights devoted to research in a UT Dallas laboratory have earned one high school student a trip to Washington, D.C., to compete for honors among the nation’s elite young scientists. Joshua Choe, a senior at St. Mark’s School of Texas in Dallas, is one of 40 high school students chosen as finalists in the prestigious Intel Science Talent Search, the nation’s oldest pre-college science and math competition. Choe is the only finalist from Texas for the competition, which will be March 10-16 and present more than $1 million in awards.